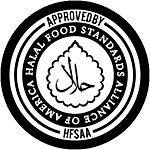 Welcome to Mera Khana, a clean and good quality fresh Halal meat and Asian grocery food store. Mera Khana is a family owned and operated store which aims for superior quality market goods and hand-slaughtered (Zabiha) meats backed by excellent customer service. We aim to satisfy your pocket as well as your comfort with our choice of products and commitment to safe and clean practices storewide. We go above and beyond to satisfy the customer and do not subscribe to the "this will do" mentality. We welcome you to come experience the difference.